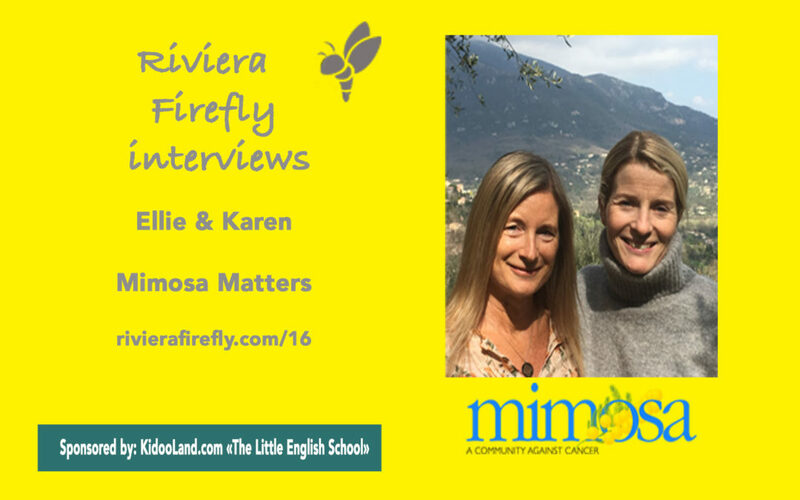 In this Riviera Firefly Episode 16 Antonia chats with committee members Ellie Goblet d’Alviella and Karen Hockney from Mimosa Matters a fundraising organisation with a difference .. a team of 9 incredible women here in the South of France dedicated to raising funds that then flow into existing established cancer charities. This is part of the Riviera Firefly podcast continuing the community series . You can go back and find our previous episodes on rivierafirefly.com/14 for Al Roberts from the Blah Blahs about a music event 1 max de Bruit in May raising money for autism and /15 for the episode where Julie Hellon shares why and how she set up Kenyan Kids. Mimosa Matters is a very unique concept and is having a direct impact , a positive impact for us here on the Cote d’Azur. This is about their personal journeys – what led them to take up the fight against the big C, these are real life superwoman armed with capes who are turning a negative into a positive .. and they need you .. all help big and small is most welcome..
For fun things amazing things..like the Mimosa Ball and Cocktail events, The Nice to Cannes Marathon and they are ready to hear your ideas for smaller events throughout the year..
[03:00] Ellie grew up down in Eastbourne for an Enid Blyton kind of up bringing and Karen had a more street wise upbringing in London. We talked about their moves to the South of France. [08:48] RIVIERA SCOOP The Boy in 7 Billion new book co-written by Karen with Callie Blackwell will be published by Mirror Books available April 6th 2017. Mail on Sunday is doing a serialisation, The Mirror and This Morning’scPhil and Holly are doing interviews as are the Metro and the Sun. It’s a “Fantastic” book and Derry’s incredible journey a care with cannabis. [10:42] Open the debate on using alternative treatments and therapies for treating cancer e.g. using cannabis. Is there an incentive to look at medical research for cannabis oil and cannabis tincture – medicinal cannabis. California has legalised cannabis for medical reasons.More research and more clinical trials are needed. [16:00] Ellie’s brother was the trigger for Mimosa Matters. Her brother had just been diagnosed with Stage 4 pancreatic cancer – very rare for an under 40 year old over a kitchen table the idea took seed as so many had been touched by cancer. The Mimosa Ball was their first event raising 34,000 euros. The committee is run by 9 incredible women. PureDesign International has supported Mimosa Matters with IT and publicity support. The Mimosa Ball: 13th May 2017 held at the Royal Mougins Golf Club in association with Yachting Partners International (YPI) . The Nice Cannes Marathon ..join in even if you can only do a stage. There was an after party in Ma Nolan’s in Cannes. They are looking for more people to fundraise .. Do you have an idea? Go and speak to the Mimosa Matters. Just arrived and you want to meet more people join this community. What happens to the money ? All the money is fed into partner cancer charities. Pediatric oncology unit in l’Archet allowed children to have entertainment in the summer and had trips to Disney. [23:00] Karen’s story through her cancer journey and the support she received during her treatment in particular the support Cancer Support Group 06 (CSG06) help with legalities and translations and support the anglophones. [30:00] Who Mimosa Matters are hoping to work with more in the future. and Breathing Out by Karen Hockney available on Amazon because it is is an essential tool for cancer sufferers and their families to understand from both sides. Mimosa Matters info@mimosamatters.org http://www.mimosamatters.org Find out more – how you can get involved, support, fundraise and put back into the community. Nicknamed The little English school in Sophia Antipolis they run activities in English, for 0-16 years olds in term time and in the holidays. Try dance on Wednesdays for 3-4 year olds or computer programming for 8-12 year olds in the holidays it’s all in English.